MOST OF US KNOW the feeling of sinking your teeth into a familiar dish from your past and being instantly transported to childhood memories. So many of the sentimental dishes below exist for me because Taiwan has the best food in the world. I might be biased, being ethnically Taiwanese, but even so Taiwan is known for its delicious food and especially its street vendors. Here are the 23 dishes from Taiwan that you might love to try. Scallion pancakes are a flatbread mixed with generous amounts of oil and minced green onions. I’ve tried making these at home and despite what many recipe books tout as an easy recipe, all I learned was that I’d rather leave it to the professionals. Reminiscent of a fried crispy croissant, the perfect scallion pancake is light and airy, with a crispy bite, ending with a rich and layered green onion-infused saltiness. Look for a little stall called Tian Jin Flaky Scallion Pancake to try this classic Taiwanese snack. My mom and grandmother could never master the flavor of Oyster Vermicelli at home, so during my summers in Taiwan, I always waited in anticipation for when my uncle would burst in with bags of the noodle soup dish. My favorite oyster vermicelli vendor operated down the street and in 1997, a bowl of soup cost just 20 cents. These days the noodle soup sets you back about $2. Just point to the steaming pot behind the counter and the cook will ladle out the unctuous soup, filled with briny, mini oysters and noodles with the perfect amount of QQ. This word has no direct translation in the English — in Taiwanese QQ means that a dish has the perfect amount of springy texture. The best place to try this prized Taiwanese delicacy for the first time is at the Shilin Night Market. 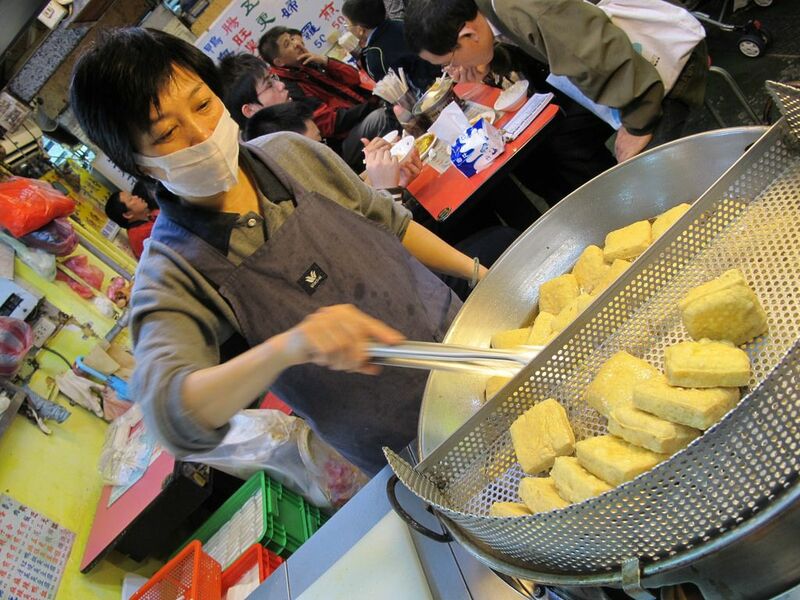 It’s definitely an acquired taste, and this particular stand’s fragrant tofu is made from a family recipe passed from generation to generation. This street food is presented with a generous dollop of sweet and fiery red sauce. 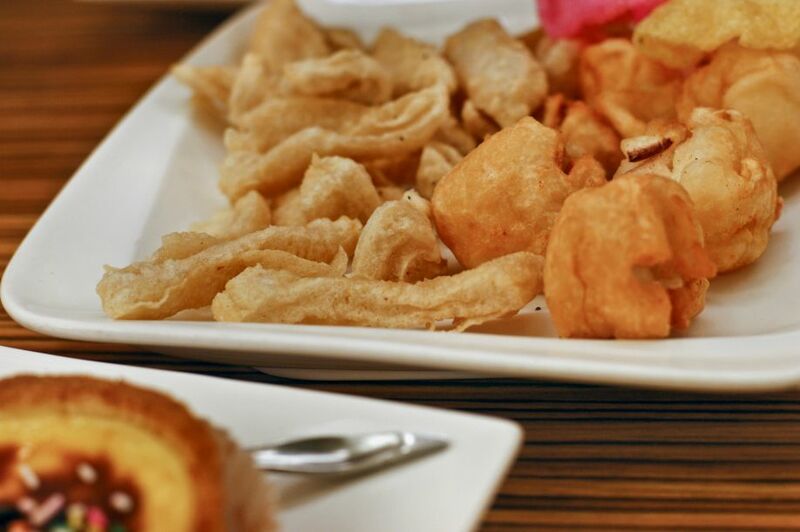 The crispy skin has the perfect amount of crunch which gives way to the creamy, buttery center. Asian Americans call bubble tea ‘Boba Milk Tea’ and you can buy it all over in Los Angeles. At the hipster cafe Urth Caffé in LA you can enjoy an ice blended green tea boba. Most people don’t realize that Bubble Tea originated in Taiwan in the 1980s. Green tea was the most popular flavor when the drink first premiered but now you can get the drink in any flavor imaginable, though you really have to go to Taiwan because the boba shops in America never get it right. The boba in Taiwan is delicately sweet and meltingly soft with the perfect amount of QQ. The tapioca balls at the bottom of the drinks outside of Taiwan are just way too chewy. Check out Chen San Ding Bubble Tea on Luosifu Road in Taipei, Taiwan. Biandang are similar to Tokyo’s ekiben, to-go bento boxes that were first sold by the Taiwan Railways Administration for commuters on trains. These train station biandang’s mostly consisted of a fried pork chop, seasonal side dishes and veggies, a soy sauce egg and tofu. Nowadays these lunch boxes can include any combination of meats and veggies. It’s a comforting and filling lunch option for office workers and students in Taiwan. Taiwanese pork balls have Taiwan’s popular QQ texture because it’s they often have cuttlefish mixed in to give the meatball a distinctive bounce. Pork ball soup is a popular and soothing Taiwanese snack — like our chicken noodle soup. It’s a deeply rich bone broth filled with pork balls, topped off with fresh green onion and coriander. 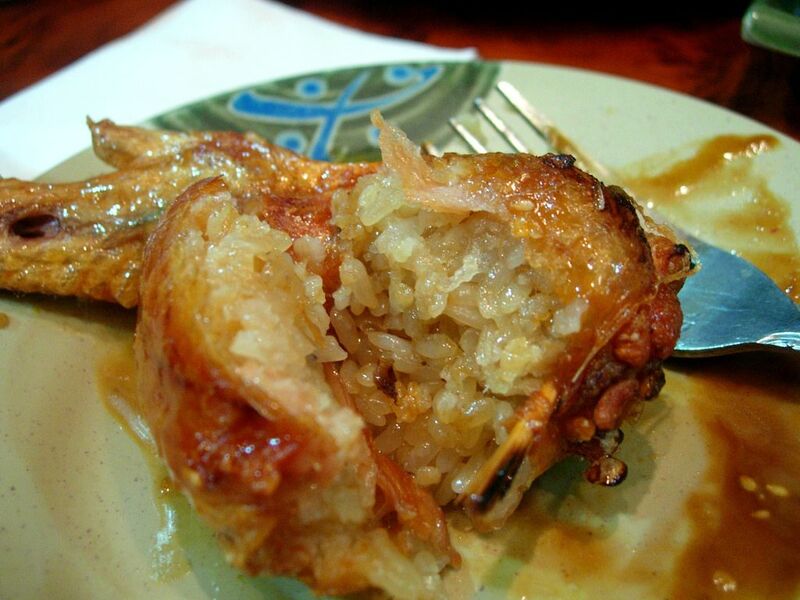 A popular night market snack, chicken wings are stuffed with fried rice. The wings are then marinated in a secret sauce and a fragrant sesame oil resulting in an extremely juicy and flavorful bite. Bite into the chicken wing while walking through the night market and you’ll get a mouthful of chicken fried rice without having to sit down with a fork and a plate. I laugh every time I see ‘thousand-year-old egg’ presented as a disgusting eating challenge on shows like The Amazing Race or The Fear Factor. The Taiwanese consider the ‘thousand-year-old egg’ a timeless delicacy. It is an acquired taste and is also known as the Century Egg or in Mandarin Chinese as pidan. Pidan is also popularly served as an ingredient in rice porridge for breakfast or at dim sum. An egg is aged from weeks to months and turns into a greyish black color, which can be shocking to those not familiar with it. It tastes very similar to a hardboiled egg except that it’s surrounded by a jelly-like casing. The yolk has a faint sweetness and a full-bodied flavor similar to creamy cheese, and tastes great when paired with rice. 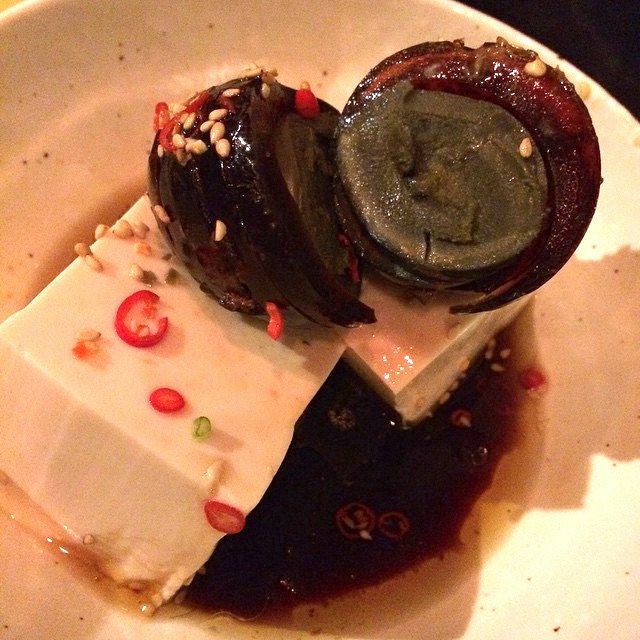 Pidan tofu pairs the Century Egg with silken tofu. It’s served cold and is often topped with garlic, green onions and pork sung and finished off with a thick, salty-sweet soy sauce dressing. Sanbeiji is popular all over China and Taiwan, although the Taiwanese have a much sweeter spin on the original Chinese recipe. Taiwanese Sanbeiji features equal parts soy sauce, sugar and sesame oil as compared to the original of equal parts soy sauce, rice wine and oil. This a braised dish, cooked and served in an Earthenware pot. 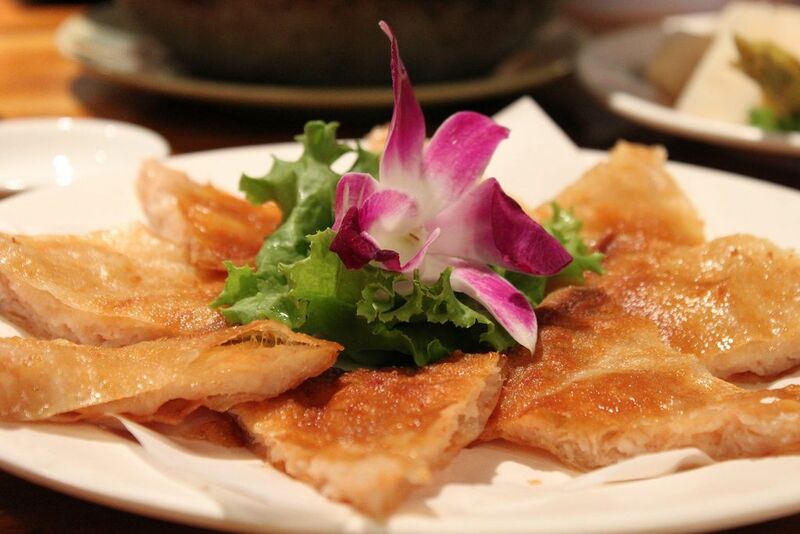 The chicken comes to the table sizzling and popping with a lightly crisped skin. The best place to taste this dish is at my grandma’s house. Taiwan has a serious street food culture, with new tastes and treats popping up constantly. One popular mainstay of Taiwan’s street food scene is the Pig’s Blood Rice Pudding served on a popsicle stick, like a delicious treat for the offspring of zombies. It’s a semi-gelatinous rice cake drenched in pork blood, steamed, and then doused in a sweet sauce. It’s then coated with a dusting of peanut flour and topped off with cilantro. It’s sweet, mochi-like and savory all at the same time — the anti-popsicle. 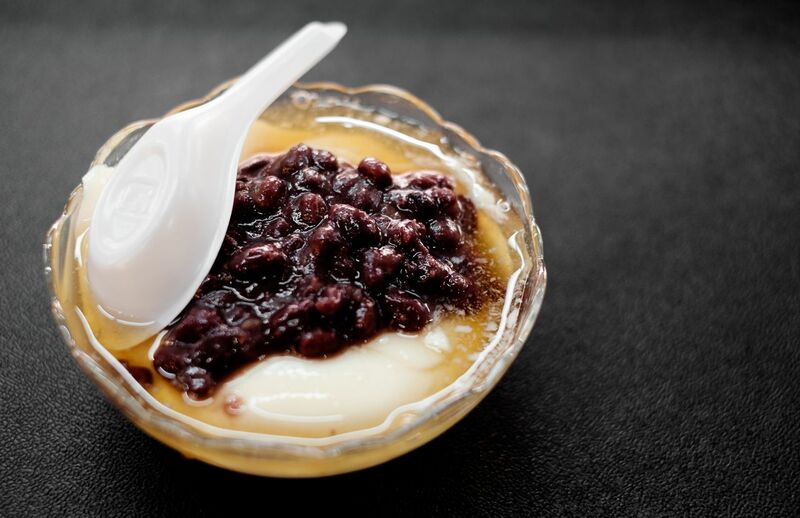 A great place to try it out is Zhu Da Lang Pig Blood Rice Pudding. An entire article could be dedicated to all the dishes that make up the Taiwanese breakfast, but I will just focus on the Youtiao. 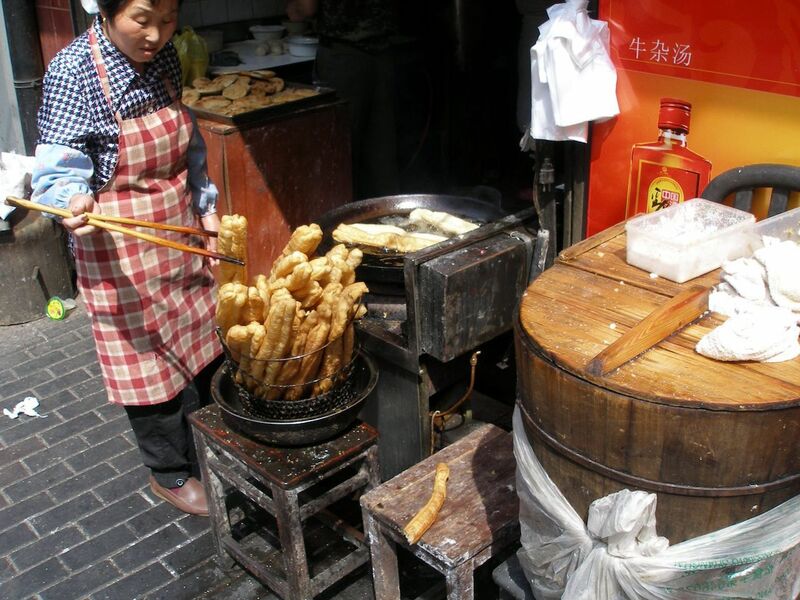 Youtiao translates into oil stick in Mandarin and it’s also known as the Chinese Donut or Cruller. Typically the length of your arm, it’s a fried piece of twisted dough often accompanied by sweet or savory soy milk, rice porridge or sandwiched between a Chinese roasted flatbread. Fuhang Soy Milk in Taipei serves the ultimate youtiao. Known in Chinese as Xiaolongbao, these soup-filled dumplings originated in the Jiangnan region of China. Many will say that the Taiwanese dumpling chain Ding Tai Fung has mastered the art of hand-making these delicate dumplings. With outposts all around the world, each restaurant features a brightly lit kitchen, where customers can view dumpling masters furiously and artfully kneading the thin dough and stuffing the dumplings. 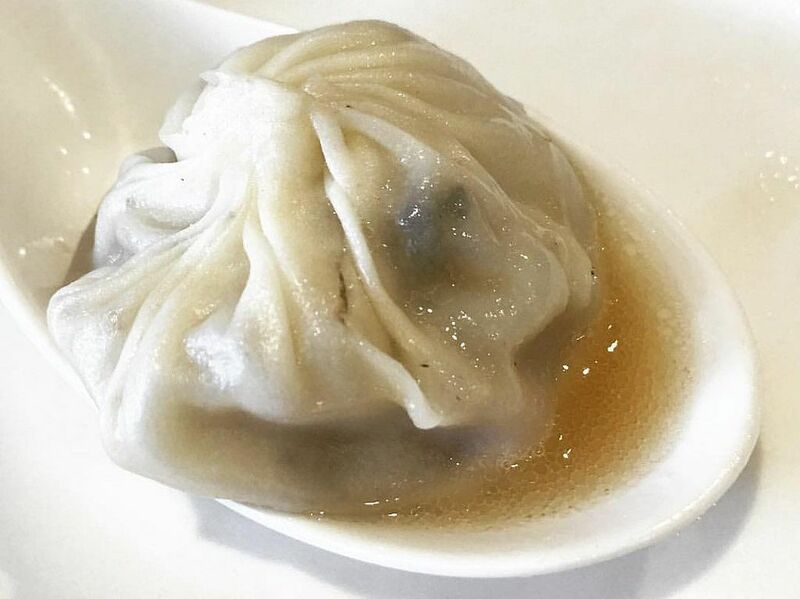 It’s recommended that you bite a little hole in the dumpling and let the soup fill your spoon before putting the dumpling in your mouth. You don’t want to get burned by the piping hot, flavorful pork broth inside. Milk ice or snow ice is all the rage in Los Angeles at Taiwanese eateries and I’m sick of it. I just want the regular Taiwanese shaved ice from my childhood, topped with almond jello, condensed milk, mango, and rice balls — known as Baobing. A special machine is used to shave ice into super-fine shavings which are then flavored with sugar cane juice. The fun part is selecting your favorite toppings, of which there are at least a dozen to choose from. 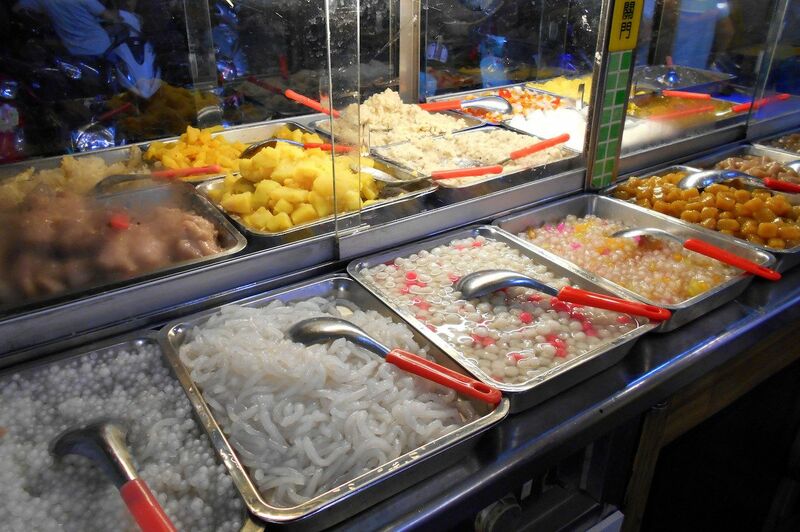 Topping favorites include boba, grass jelly, red bean, and more. These noodles remind me of shopping excursions in Taipei. On a rush to score the best deals on luggage, clothing and knickknacks to bring back to the United States, we would grab a quick refreshing lunch of Taiwan’s cold noodle salad. In the humid tropical summers of Taipei, this salad was a cooling revelation. It’s incredibly simple, just cold noodles, chopped cucumber and carrots but the touch that pulls everything together is the tangy peanut and sesame dressing. Mix it up all up as you would with bibimbap, and top it off with generous amounts of chili oil to give it an extra kick. I love enjoying it at Taiwanese Cold Noodle in Kaohsiung, Taiwan. It seems like every culture has mastered their own version of fried chicken. 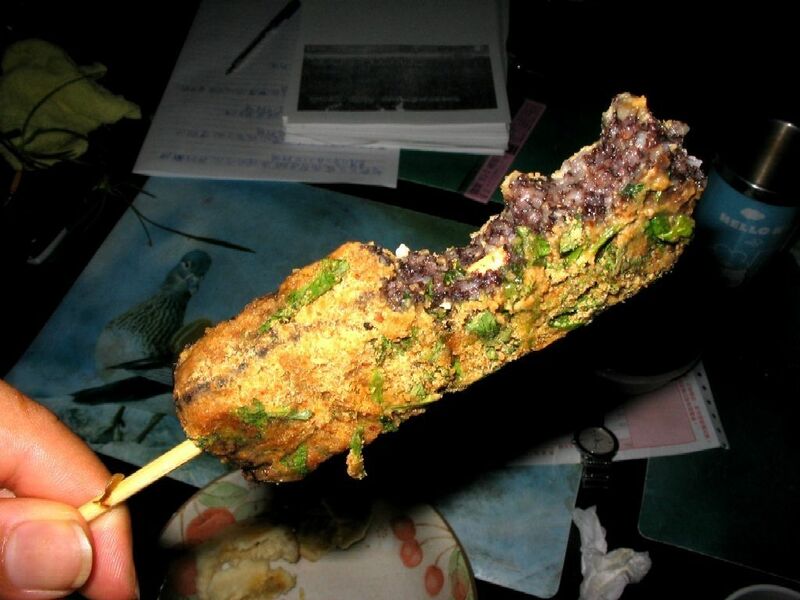 The Taiwanese street food version is called popcorn chicken and is most commonly served with skewers in a paper bag. 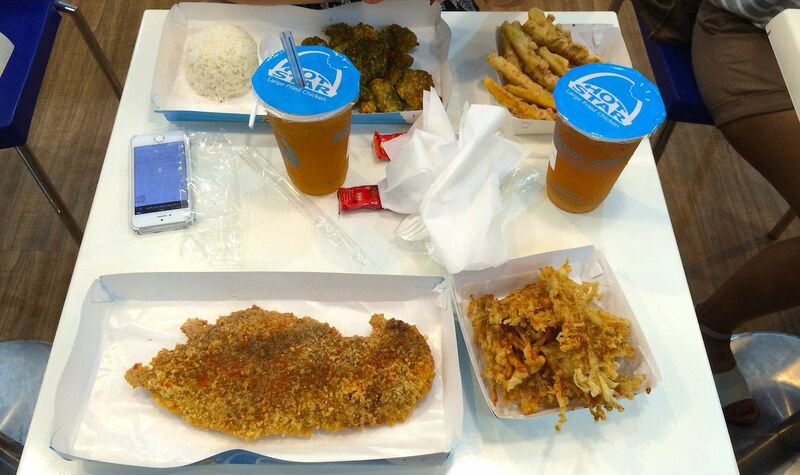 In recent years, it’s been overtaken in popularity by Hot Star Fried Chicken, a huge piece of fried chicken the size of your head. These chicken dishes use a secret, herbal marinade, and many are happy to wait in long lines to enjoy this juicy, salty chicken treat. Hot Star Fried Chicken has recently opened an outpost in Los Angeles but the original stand in Taipei is still the best. Tian bu la is Taiwan’s version of Japanese oden, although much chewier and more QQ than the Japanese version. Served fried on a stick or in a bowl, it’s another popular street food that is QQ and slightly sweet and savory at the same time – tian bu la literally translates into ‘sweet not spicy.’ The Shilin Night Market features many street food stalls serving this tasty treat in many variations. The Taiwanese enjoy another black egg delicacy, although it tastes totally different from the Century Egg. These stewed eggs are a great bar snack, with a chewy texture that is both spicy, salty and sweet. They are often sold at supermarkets or on the street in vacuum sealed bags. They are called iron eggs because they are much harder and chewier than regular boiled eggs. Very different from American versions of pineapple cake, this beloved Taiwanese treat is my favorite edible souvenir to bring back for friends and family when returning from a trip to Taiwan. Taiwanese pineapple cakes originated as a result of the pineapple surplus in the late 1930s, as Taiwan became a leading exporter of pineapples. It’s a simple pastry, just consisting of butter, flour, sugar, egg and pineapple. It’s flaky and buttery and lightly sweet featuring a tangy pineapple filling in the center. 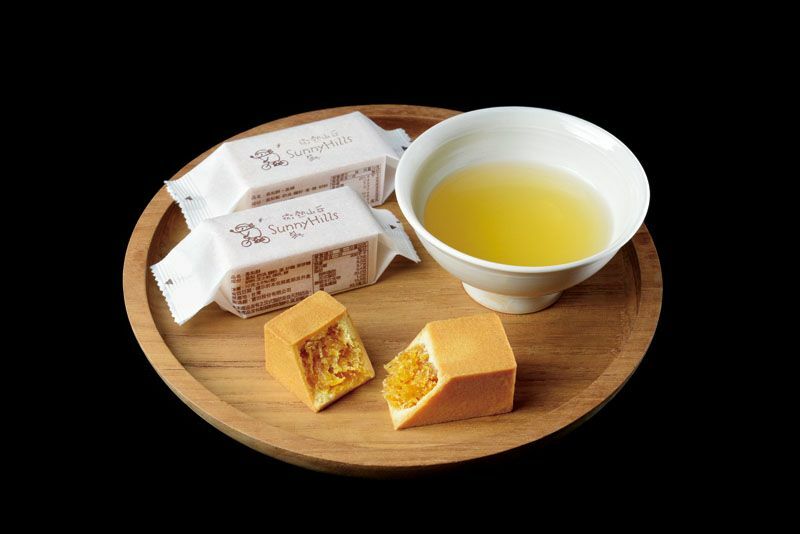 Sunny Hills is one of the most popular pineapple cake purveyors in Taiwan. 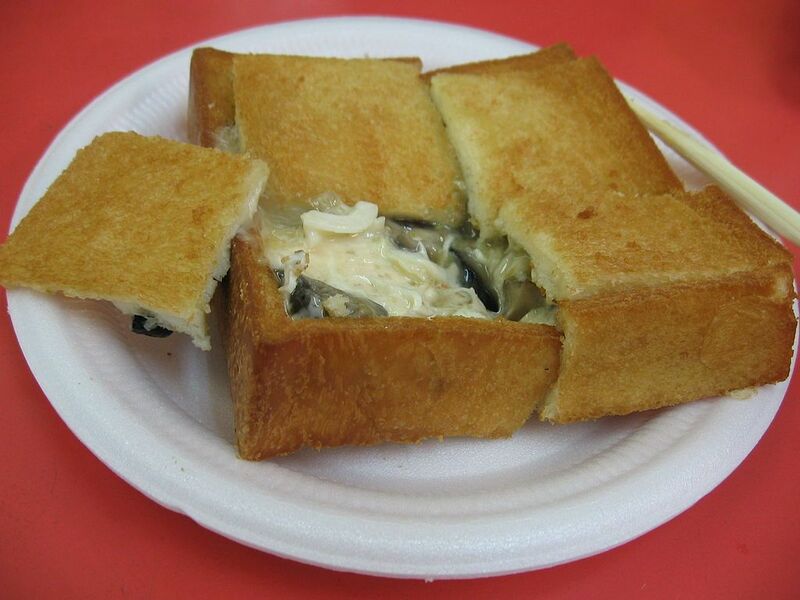 A totally wacky street food creation, coffin bread in Taiwan has been around in Tainan since the 1940s. It’s similar to bread bowls that you can order with clam chowder, except that its square in shape. The bread is hollowed out and then toasted and filled with a creamy soup. The top of bread is placed back onto the dish before serving – thus the coffin. It has similar flavors to a chicken pot pie, with the rich buttery bread crust setting off the bechamel flavored stew inside. The soup base of Ro Geng Mein is thickened with cornstarch and is the ultimate Taiwanese comfort food. Ro Geng Mein is topped with delicious cloud-like blobs of pork and fish cake, and plenty of cilantro. Also included are crunchy slivers of bamboo and mushrooms. The comforting taste of the soup is punched-up by a tangy, generous dollop of black vinegar. Douhua is a Taiwanese dessert made with the softest of tofu. The tofu disintegrates and melts as soon as you take a mouthful of this sweet treat. It can be served on ice in the summertime with a gingery sweet syrup to flavor it. 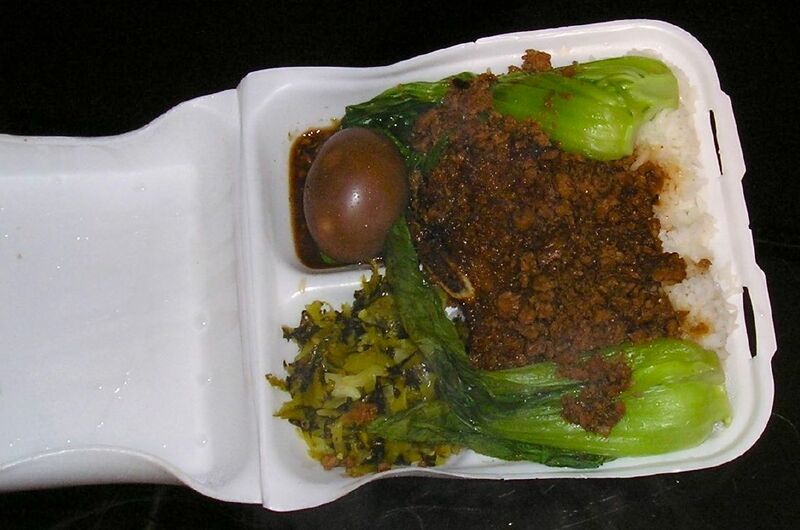 Douhua is also delicious heated up in the wintertime, topped with peanuts, boba, mung beans and more. Douhua Zhuang in Taiwan serves it up right. This local delicacy seems to have stayed in Taiwan, I’ve never seen it served here in Los Angeles or anywhere else outside of Taiwan, even though here in Los Angeles we have a proliferation of authentic Taiwanese restaurants. Seasonal baby bamboo shoots are slightly cooked, chilled and then served with generous amounts of thick, Japanese mayo. As with most simple recipes, the key to this dish is in the freshness of its ingredients, the bamboo should be fat, juicy and seasonal — this dish is best served in the Winter or in the Spring.